The Sony Xperia Ear Duo is a hearable we've been talking about for a long time. In fact, our features editor Sophie first got a look at the original concept two years ago. Until it became the Duo, we knew it as the Xperia Ear Open Style. Now it's here and available to buy, the question is whether Sony's new hearable was worth the wait. Well, the first question is: what can it do? The Ear Duo will let you stream music from your phone without any cables, but there's plenty more to this unique looking device. The Duo is named so because its standout feature is the ability to hear music and ambient sound at the same time without it sounding like a big muddling mess. It's not quite the augmented audio you'll get with Nuheara's IQBuds. Think more augmented audio lite. It also works with Google Assistant and Siri smart assistants to give you control from the ears along with Sony's own contextual assistant, which serves up useful data depending on aspects like time of the day and your current location. Throw in some gesture features a la Bragi as well and Sony's offering a lot here. At $279.99 though, they don't come cheap. These aren't as pricey as the Bragi Dash Pro ($329), Nuheara's IQBuds ($299), but next to Apple's AirPods ($159) they start to sound expensive. So are features like dual listening and changing music tracks with your head worth spending big on? We've been spending some time getting to know the Xperia Duo for the past few weeks to find out. Oh Sony. How this made it through the design department at Sony HQ without someone saying, 'hold on, don't they look a bit... weird? ', I do not know. If you were apprehensive about the thought of wearing something in your ears that resemble white toothbrush heads, putting on the Xperia Duo is something entirely different altogether. What you get with the Duo is something so awkward looking that I couldn't help but feel incredibly self conscious. Granted, they are slim, well made and clearly built from high-grade materials, but they just felt ridiculous when they were on. That was confirmed by pretty much anyone I cared to ask for an opinion. It's a shame really, because despite the unbalanced design, they are actually pretty light and comfortable to wear. Each side weighs just over 10g and there's never a sense that they weigh heavy on the ears over long periods of use. Getting them on is another big issue. Never have I had so many problems getting on one pair of headphones or hearable that it has time compelled me to grab a pair of wired headphones instead. With zero flexibility in the materials used (aside from the hollowed out silicone earbud), you're required to squeeze the bud into your ear while tucking your earlobe underneath the small metal bar that connects the bud to the main core of the Duo. It sounds straightforward, but believe me, it's fiddly and irritating. If you don't do it properly, the earbud becomes loose. Maybe if it wrapped more ergonomically around the ear, things would have been worked out better. Sadly, that was not the case. Once you have managed to get them in and onto your ears, it's time get acquainted with the touch sensitive controls baked into the Duo. Each side of the Duo is assigned different controls. On the left, you can do things like play/pause music while over on the right you can swipe up and down the surface to adjust the volume. That's not your only way to take control either. There's also gesture support, letting you move your head left or right to answer/reject calls or skip through music tracks, which actually works well. There's no need to make exaggerated movements, and while you might favour using this feature when there are fewer people around, it's a nice alternative when you're in the gym or out running and don't want to fiddle around too much with controls. The Duo has an IPX2 water protection certification, which basically means these are not built for swimming or taking a dip in the sea. If you care about colors, you've got your pick from black or gold. We can only vouch for the black model, which is really more of a grey and pulls off that industrial, machined look. In sum, it's a design of few positives in our eyes. So let's get to the special stuff. What actually makes the Sony Xperia Ear Duo smart? The first thing is that unlike noise-cancelling headphones, these are not about blocking out the outside world. It's about hearing both the ambient sound and your own private sound at the same time in a way that doesn't feel a bit of a mess. The Duo can also automatically adjust volume to compensate for moving into busier environments but not sacrifice the ability to still hear everything around you. The tech that's making that happen lies with two spatial acoustic conductors and drivers that transmit sound to your ear canal, connected to a module that sits just below and behind your ear. While this sounds like the augmented audio that the now-deceased Doppler Labs and more-alive Nuheara demonstrated with their smart earbuds, the user doesn't have control over how the sounds are filtered. It's all down to the technology on board to make it happen automatically. And it actually works really well. The idea is that you're not supposed to notice the automatic tinkering, and you really can't. The changes or adjusting are subtle and while the dual listening can seem more skewered towards the ambient sound as opposed to your own music, the result is largely a pleasant one. The best example of the tech at work was travelling on the train to work or in office where I needed to zone out, where I could still hear someone if they called my name. The result is that sounds feel like that they sit somewhere on the same spectrum without battling against each other. But this comes at the expense of sound quality. For $280, my expectations here were pretty high - after all, that's a lot of money to pay for average sounding headphones. 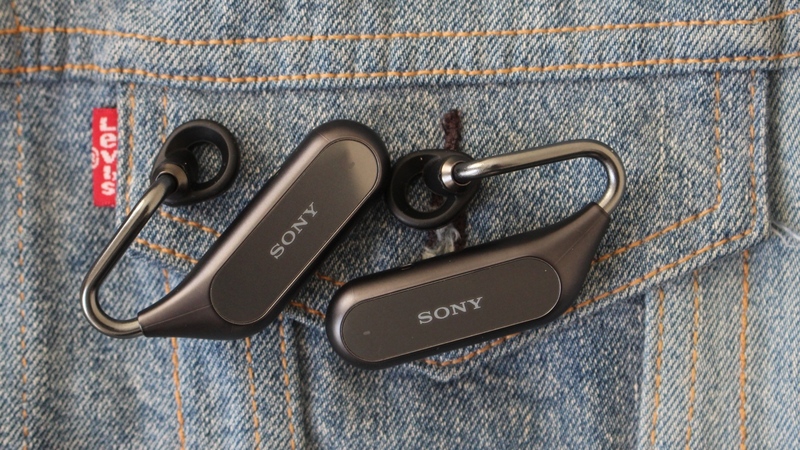 In typical Sony fashion, the Duo deliver admirably on the clarity and detail front. Whether it's music, taking calls or listening in on your smart assistant, it's all good here. If you're yearning for bass and some power, these are not going to give it to you, simply owing to a design that is not built to block out or drown out the world. It means even at maximum volume it can still sound a bit feeble, especially in comparison to rival smart earbuds. If you're expecting big things for music, you're going to be disappointed. Away from dual listening, smart assistant support is another one of the Duo's headline-grabbing features. Like a lot of headphones now, it will play nice with Google Assistant (for Android) and Siri (for iPhones), and there's nothing out of the ordinary in terms of the integration. You can tap and press on the right of the Duo buds to launch the smart assistant on your phone and ask things. Paired to a Pixel 2 XL and the iPhone 6S, the support did feel flaky at times, sometimes struggling to recognise simple commands like launching apps, but more basic requests for things like the weather worked fine. It was definitely hit and miss with both assistants. Then there is Sony's own smart assistant, which it simply calls Assistant. For someone still not entirely comfortable talking to tech, this was the feature that intrigued me the most. The concept behind Assistant is that it will read out information based on your location, activity and the time. To make the most of it you'll need to enter some information first, like your name, birthday, home address, workplace. From the app, you can customise what information is read out to you including notifications and it doesn't take long to find out that it is worth doing. As I leave the house and put the Duos on, I'm greeted my an English woman's voice who wishes me a good morning and reads out the time, then proceeding to tell me the weather and a rundown of some news stories. For me, that's helpful information, and I do decide to run back inside and grab a coat just in case I get caught in some rain. The news stories are fine, but the read-out is in true text-to-audio style, which can sound a bit robotic not very personal at all. If you leave you notification feed stocked with read and unread notifications, prepare for the Assistant to read every single word out to you (and I mean every word). The location, time and activity-based assistance is something I don't feel I ever experienced in my time with the Duo. I certainly like the idea of it, but I had no evidence to suggest it actually works. Battery life on the Xperia Ear Duo hearable entirely depends on how you plan to use it. We'd imagine for most that would be for listening to music and in that instance you'll get up to four hours before you'll need to drop it inside of its charging case. To put that into perspective, Apple's AirPods and the Bragi Dash Pro muster up five hours of listening time. The Duo definitely deliver around that four-hour mark, but factor in that charging case and you'll get 16 hours. The fast charging support is a nice touch giving you an hour of power from just seven minutes of charging. We should talk about the charging case as well. The circular home for the Duo is slightly bigger than the average charging case you get with a pair of smart earbuds, but it allows for a magnetic system that ensures the earbuds give that satisfying click when they fall into place. The two small LED lights on top of the case are assigned to each side, letting you know when they are powered up and ready to use again. You have to applaud Sony for trying to do something different with the Xperia Ear Duo. It built a hearable that could never be accused of simply trying to blend in with the crowd. It's tried to find an answer for people who don't want to drown out the world but also want to listen to their music. It's even taken a try at its own smart assistant. But the design will leave you scratching your head, the dual listening leaves music lovers out in the cold and the smart assistant needs some work. If you want a truly groundbreaking hearable, Bragi's or Nuheara's smart earbuds are much better fit in more ways than one. While I doubt it will ever happen, I'd love to see Sony release a plain wired version of these (with a traditional remote/mic in the cable).